Roasted Butternut Squash w/Spicy Onions | eat. live. paleo. I LOVE this recipe. It’s a great party side dish, it’s delicious as well as pretty! P.S. 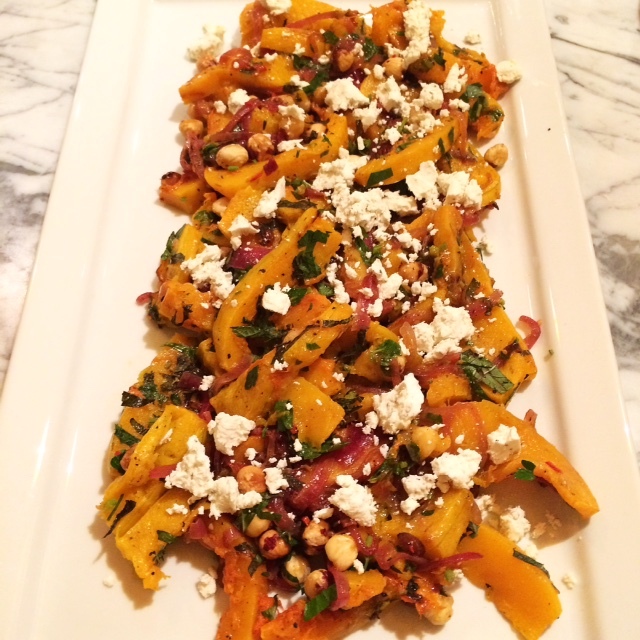 I have since made a further modified, much simplified version of the recipe, with just the squash and onion mixture, skipping the cheese and hazelnuts. And that was fantastic, too. Below is my adaptation of the Bon Appétit recipe. 1 cup blanched hazelnuts, coarsely chopped. Heat oil in a large skillet over medium-high heat. Cook onion, stirring often, until slightly charred and softened but not falling apart. Add the serrano chilis, toss to combine. Remove pan from hear and mix in lime juice and honey. Let cool, then mix in zest. Set aside. Preheat oven to 400F. Toss sqush and 1/4 cup olive oil in a large bowl, season with salt and pepper. Divide between 2 rimmed baking sheets/pans lined with parchment paper. Reserve bowl. Roast, undisturbed, until tender, 20-25 minutes. Return squash to bowl. Add hazelnuts, parsley, mint, thyme, and spicy onions, and toss to combine. Transfer squash mixture to a large serving platter, crumble goat cheese over. Drizzle with olive oil (optional).